Enjoy a peaceful evening in Brown County at Moon Shadow Pines Log Cabin! Moon Shadow cabin, nestled in the hills of Brown County, offers privacy, relaxation, and charm. Relax on the deck overlooking the treetops or in the six-person hot tub. 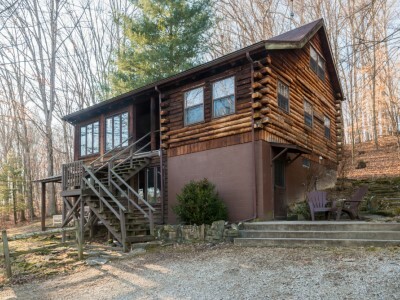 This cabin has 3 delightfully decorated bedrooms with new queen size beds, 2.5 baths, large deck, hot tub, large living area with three-sided fireplace to snuggle up on those cool nights, bbq/campfire area, tree house, horseshoe pit and 10 acres of woods to explore. It's close to Nashville with its many activities, as well as the historic Story Restaurant, and Brown County State Park. Moon Shadow's well-equipped kitchen (microwave, stove/oven, dishwasher, cooking utensils, etc.) an antique table that can seat 8, a sunroom adjacent to the living room and fireplace, and room for the kids to play in the finished lower level with a foosball table and a sleeper sofa. One of the three bedrooms, is sure to match the personality of everyone in your family. 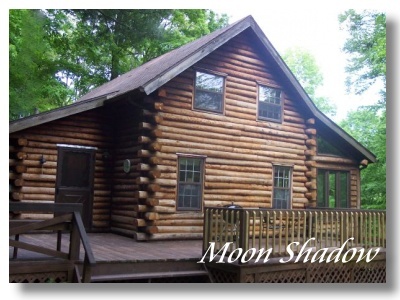 Moon Shadow Log Cabin... a wonderful, private and relaxing vacation getaway in Brown County Indiana for that special Honeymoon or Anniversary.